Waves broke against the sleek bow of the ship. The craftsmanship of the dwarves mixed with the style of elves was beautiful. Yet she had known this for the years she spent in the kingdom she had left. Standing near the bow of the great and colorful merchant ship, an elvish woman with pale skin and dark clothes examined the landmass that they were nearing. A journey like the one she had chartered was not very common as the land and the known kingdom was far over treacherous seas. Still, with a sizeable amount of gold as collateral, the captain accepted the challenge with glee. 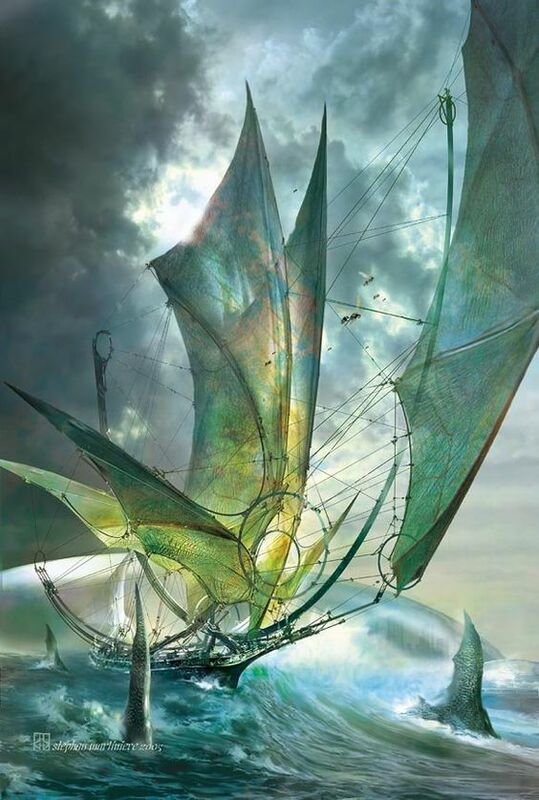 The morning sun broke through the cloud cover of the new day and glistened on the green silken sails of the ship. Quickly the elf blocked the rays of light from stunning her eyes with her hand. Heavy footfalls moved to the bow of the ship where the woman stood alone, her eyes affixed on the nearing port. "This was quite the adventure, aye lass?" A stout dwarf found his way forward and moved to the railing that outlined the edges of the boat. Raising a spyglass to his eye, the elvish woman crossed her sleek arms across her chest. Her dark hair blew in the salty wind as a heavy breeze continued to pull the ship forward. "This is only the beginning. Though, I thank you, captain." Chuckling, the dwarf captain collapsed his spyglass and placed it safely inside of a pouch that was attached to his waistbelt. With a great smile, he turned and looked at the woman. His calloused hand carefully brushed at his cheeks and down his long braided brown beard that extended down to his thick belly. It was obvious he was studying her. He had done so the entire journey. Sizing her up. Trying to find out why someone would want to go to such a faraway place. "Well lass, I hope you will find what yer lookin' for." His green eyes looked her up and down once more in a way that made the elf's skin crawl. Yet she kept herself calm as her gaze turned to meet his. "We'll be making port soon, I suggest you get prepared." With a slow nod from the woman in confirmation, the dwarf man left her to her business. Orders were quickly barked about the ship as the crew prepared to make port. As the commotion continued the woman clasped her hands together and positioned the signet ring before her lips. "Protect me, Mistress. That I may do what you willed." Her voice and the language she spoke was barely a whisper that the sea breeze quickly carried away. Although, a cold feeling swelled in her as if answering her words. The woman was used to the chill touch and gave a genuine smile as she closed her eyes. As her eyes opened, the ship was nearly about to dock at the harbor. Remembering the captain's words, the elvish woman quickly moved to her bunk below decks to retrieve her personal belongings. Of which she didn't have much. Tenderly she removed a black enamel rose trinket from her pack and carefully placed it behind her ear. Suddenly, the rose seemed to become real by magical means and a dark vine began to tie her hair behind her head. Other black roses sprouted from the vine as it grew to contain her dark hair. With this little touch, the elf woman took the rest of her belongings and went above decks. Her timing was lucky as the ship had just docked and was beginning to let the crew members off with various trade goods from the distant kingdom they hailed from. The woman quickly slipped through the moving crew members and out into the Harbor. While she had no clue what to expect from the kingdom of Azuria, she wasn't the least bit surprised that a few passersby were transfixed by the sight of the strange ship that had docked at their harbor. Though she cared little for what they thought and quickly made her way around scanning the people who were at the harbor. She needed to find a way to the kingdom, but she didn't know where to start.